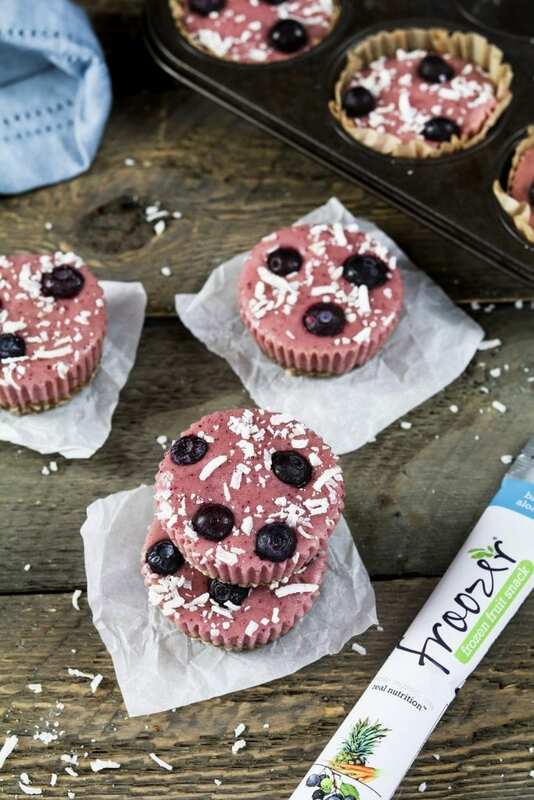 Today’s Fruity Frozen Yogurt Bites are sponsored by Froozer. 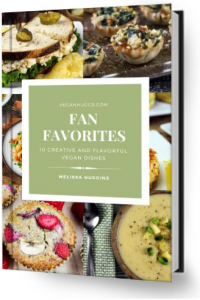 I love sharing my new vegan finds along with a tasty recipe and sponsored posts help make that happen. Thank you for your support. Happy New Year, guys! This is my first recipe post of 2018, so I decided to make it a healthy one. It feels good to get off to a good start! If you’ve decided to give up sweets for the new year, you don’t have to be sad about it. You can just choose a healthier alternative. These Fruity Frozen Yogurt Bites will satisfy your sweet tooth but won’t make you feel guilty afterward. The ingredients are simple, wholesome and totally nutritious! I made these tasty treats with Froozer Fresh-Fruit Frozen Sticks, non-dairy yogurt, almonds, dates and pure maple syrup. That’s it! I’ve heard positive reviews of Froozer Fresh-Fruit Frozen Sticks, so I was really excited to test them out for the first time. I checked out their store locator online and I was happy to see them selling in mainstream stores. So, I headed to Walmart to pick some up. Before deciding on a recipe to make, I wanted to test them out just as they were. I gave one to Grant and opened one for myself. I thought Grant might not go for them without any sugar added, but he really loved them and I was pleasantly surprised myself. They were perfectly sweet and refreshing. It’s a great tasting frozen snack made with 100% fruit – all the goodness and great taste of perfectly ripened fruits, with no added sugar, juice or concentrate. Also, they are non-GMO certified, gluten-free, kosher certified, preservative-free, low calorie, convenient, and the best part, they are VEGAN! I love that they are portable and you can grab a stick of nutrition as you walk out the door too! Froozer selects their fruit at the peak of ripeness. and then it’s flash-frozen. So, that means the peak of their nutrition, and sweetness will be preserved for you in a delicious snack. During this process, the water and fiber content stays intact too. Froozer comes in four delicious flavors, Blue Aloha, Tropical Sunset, Strawbanana Bliss and Orchard Cherry Berry. I loved them all, but the Blue Aloha was my favorite. Grant chose the Tropical Sunset. 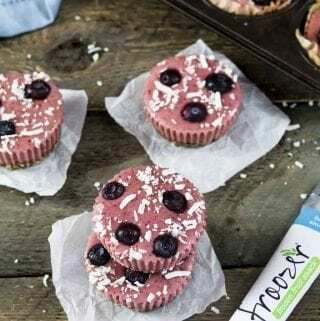 The Froozer Sticks are perfectly delicious on their own, but I thought it would be fun to turn them into Frozen Yogurt Bites. The almond-date crust adds a subtle crunch, and the yogurt makes them ultra-creamy with a hint of tang. They are deliciously sweet and totally nutritious! 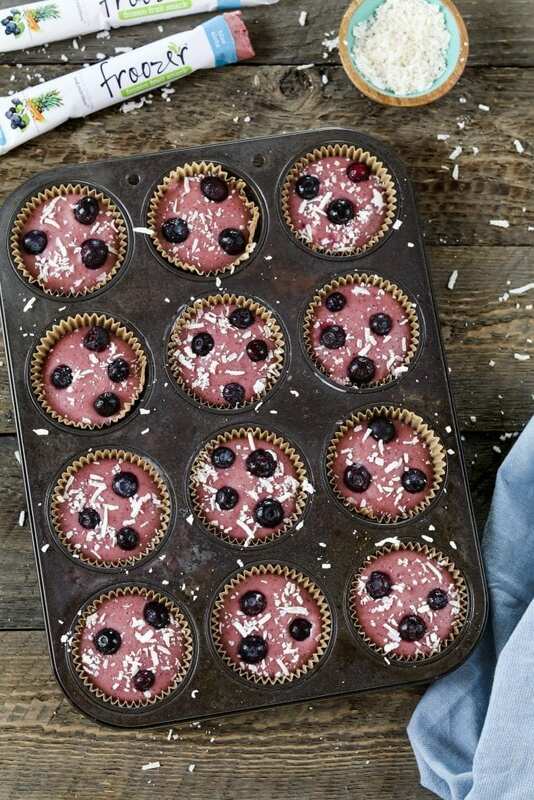 If you make these Fruity Frozen Yogurt Bites, I’d love to hear what you think in the comment section below. It would really make my day. You can also follow me on Instagram and share your creation with me. Just tag me @veganhuggs and hashtag #veganhuggs so I don’t miss it. Fruity Frozen Yogurt Bites ~ they'll satisfy your sweet tooth without the guilt. Place all ingredients into a food processor. Process until it forms a loose dough. Press between your fingers to make sure it sticks together. Add more dates or nuts for the needed consistency. Place yogurt in a food processor or high-powered blender first. Break up each Froozer stick in 2-3 pieces before adding (helps it breakdown easier). Blend until creamy and smooth. Place about 2 tablespoons of mixture on top of the crust. Add optional toppings if desired. Pop back in the freezer for about 3-4 hours for a softer consistency (longer for a solid one) Thaw for a few minutes before eating. Store in an airtight container for 3-4 weeks. * Makes about 10 Fruity Frozen Yogurt Bites. *DATES: If the dates aren't soft & somewhat moist, soak them in water for 15 minutes before using. Drain well and pat dry before use. *CRUST: If the crust sticks to your fingers and it's hard to press into liners. Use a small round jar, lined with plastic wrap to press down. I used the tamper from my food processor and it worked perfectly. I am totally making these this weekend. I need something to hit that sweet craving that isn’t full of junk. The perfect snack to indulge in that sweet craving.